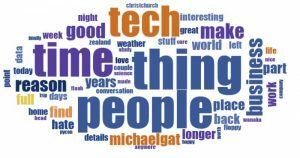 According to this word cloud of my Facebook timeline, I use the word “zealand” a lot. Also, according to this word cloud of my Facebook timeline, I do not use the word “new” very often at all. In text analysis programs, it is fairly common to exclude what are known as “stop words.” Generally words that have been found to offer little meaningful information. Which exact words are included or excluded tends to vary depending on the context. Words like “and” are generally useless, but some other connectors (like “not”) may provide useful context for the words after them. It seems odd to exclude something like “new” though, even from a stupid Facebook word cloud. That one would seem to be meaningful in many contexts. But of course the creators of this silly Facebook word cloud app aren’t interested in being accurate. I’m guessing they found that even while it was important, “new” tended to overwhelm the clouds far too often. Because people love to post about their new stuff, new experiences, new jobs, new whatever. So it gets filtered out to keep the rest more engaging. I guess it worked. They got a blog post out of me. ← New Zealand Again? Yes.